I have an embarrassing confession. I’m so excited I’m giddy like a school girl, and I’m also apparently dumb like one. 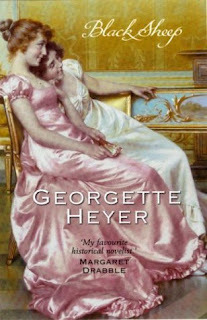 Until recently, I’d never heard of Georgette Heyer. See, told you – dumb. I had no idea of how many books she’d written on Regency England, about 60 I think, and I, who claim to love an excellent classic historical romance, have never read even one of her books. Not – one. Have I been living in a hole these last 3 decades, stuck in an Austen, Bronte rut the size and scope of my pan-handled state? And so I would still be if not for my occasional scanning of the reading bloggernacle where I recently found a lone review of this book, Black Sheep. Be still my beating heart. This is an excellent book. And I almost took it back to the library unread, shameful, wicked girl! Miss Abigail Wendover is our 28-year-old heroine who lives in Bath with her much older, often thinks herself ill sister, Selina and their 18-year-old ward and niece Fanny. Abby is quite settled in her life, where she is both nurse and confidant to her immediate family. Romance is the last thing on her mind. All remains unchanged until young Fanny thinks herself in love with a scandalous fortune hunter, a much older Mr. Stacy Calverleigh, and it falls to Abby to make Fanny see the light of this man’s true nature. When Fanny and Selina remain unmoved in their undying devotion to this man, Abby, who fears there might be an elopement at any moment, enlists the help of an unlikely ally, Mr. Miles Calverleigh, the black sheep of the family and uncle of Stacy who has just returned from banishment in India. He, however has not the temperament or desire to become involved in the situation, but instead turns his attentions toward Abby, who secretly knows she’s met her match, but outright refuses to admit it all costs. In case I haven't mentioned it enough, I really liked this book. It was written in the style of Jane Austen, but was much easier to read. Heyer has borrowed much from that great writer but in the end I couldn't have cared a wit. While the main characters were clever and sharp as a tack, it was the secondary characters as well, the nosy elderly neighbors, the friends of the family that gave this book real depth. Really? We'll maybe I'm not so bad after all. there is an excellent Wikipedia article on Ms. Heyer. she had quite the fascinating life. An author who refused to grant interviews? I wonder how'd that fly now. I haven't read her either! Sounds like I should, though. I keep thinking about it and want to read it again!